And it was a full blasts Group Campout Indeed! The Cebu Bloggers Campout 2009 Experience! 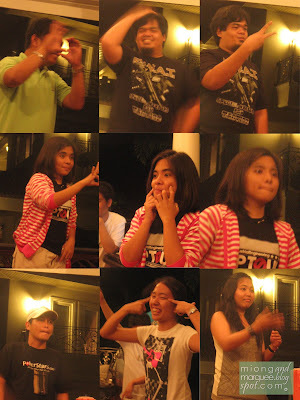 We had our group's 1st Campout Activity last April 18-19, 2009 at Mendoza's Residence in Jardin de Busay, Busay Cebu City. Great Experience and Fun. Great People and camaraderie. Recently concluded campout was a succesful one, thanks to the behind the scene Organizers and of course the CBS people. I wont be narrating the detailed story of the event and instead I will be posting some Facial Expressions and Experiences from the attendees and how they are able to manage to let their respective teammates guess the "word" that they are trying to portray in the game "Charades"
Boys+Girls Team: Ethelbert, Clado, Mikyu, Timoy, Kai and Empress. All boys team: Bryan, McBilly, Tianexx, Tanom, Ianov and Aldwin. 1. Cebu Bloggers Camp Out Creates a FAMILY. 2. The Esoteric CBS Camp Out. 5. Into the wild. wild CBS Camp Out. Kudos to all CBS People! 15 comments: on "Cebu Bloggers Campout 2009 Experience"
lingaw kaau ang camp out bai miong! heheh.. sunod napud!weeeeeeeeee! 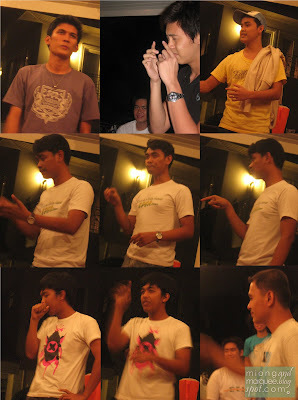 jeeezz...the bloody charades...where are the rest of the pics miong? @jesryl: see you there sa Maribago Bluewater Bloggers Blowout bai jes! @mark: wow corneto again.haha yah remember the tequila thing? @iggy: nindot baya ni mokanta si mikyu, nindot ug tingog. Salamat ani doh. Lingaw kaayo tong camp out. Dagat nasad sunod! Yahoo! @aimee: haha, thanks aimee. sa maribago bluewater nlang bawi. ito yung campout namin sa Cebu Bloggers dong.